Hoodie Blog Tour Kick-off – Everything Your Mama Made & More! 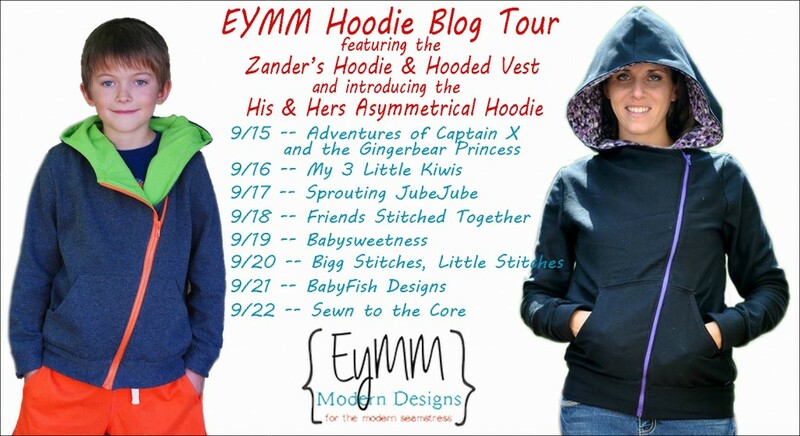 I’m thrilled to announce the start of the EYMM Hoodie Blog Tour today. Fall’s cooler weather is arriving in most of the United States and winter is pulling into spring for our friends down under, meaning the weather almost everywhere is close to perfect for hoodies! Eight bloggers will be posting during the next week and will feature either the Zander’s Hoodie & Hooded Vest or the His & Hers Asymmetrical Hoodie. The hoodies are intermediate level patterns and so the adult testing has taken a bit longer than expected to finesse and perfect the details. The His & Hers Asymmetrical Hoodie is available for pre-order this week (so you can take advantage of the coupon included in the blog tour) and will release at the end of the tour! Yay! I can’t wait to see the inspiration all these ladies have to share! Make sure to check them all out during the week.